The original post with address erased. I did a little yard sale a few weeks back and returned home to a message from a reader. 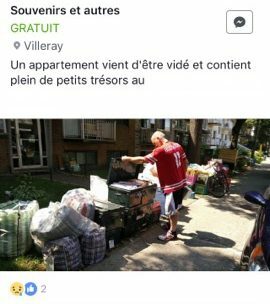 It contained a screenshot of a post on a local Facebook page informing people about an apartment being emptied in St Michel. I got the message many hours after the fact, and figured I was probably too late to find anything good. In the Plateau an obviously interesting trash pile (ie: one that attracts attention even from casual pickers) will often be ripped to shreds within a few hours. I had planned on doing a trash run in the area regardless, so I went and checked it out just in case. As you probably expect by now, there were indeed still things to be found and the pile itself was surprisingly intact. 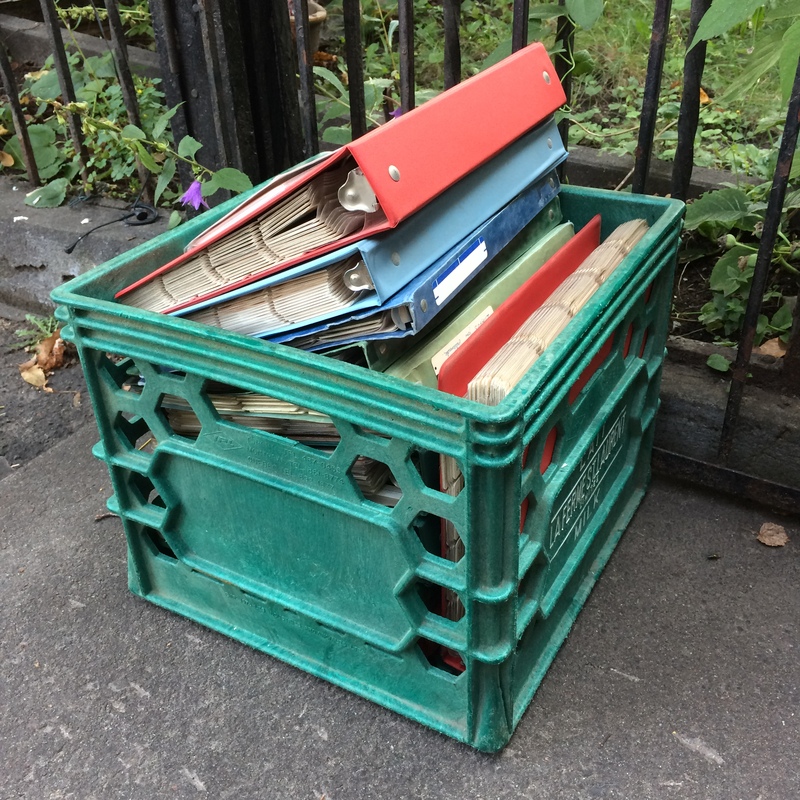 The trunks in the original picture were long gone, but most of those bags and milk crates remained – and seemed largely untouched. Maybe the pile survived that long because there’s less foot traffic in St Michel as compared to the Plateau. But it could also be that the stuff didn’t look all that interesting at first glance. 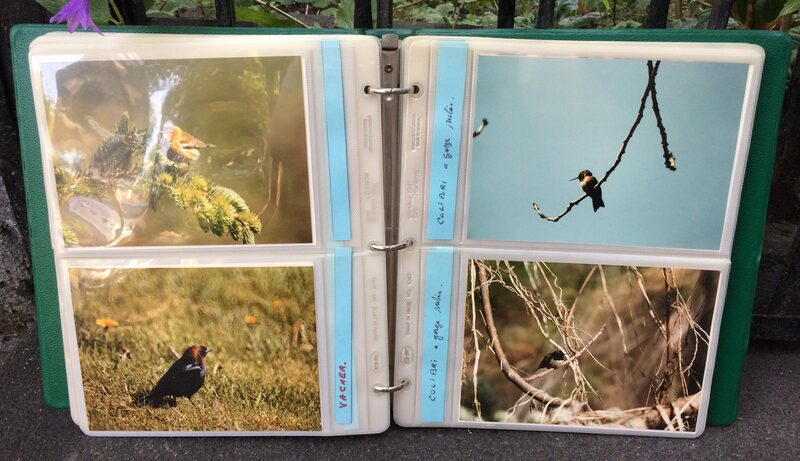 A lot of what I saved was stored inside old binders, the kind I would have used back in high school. 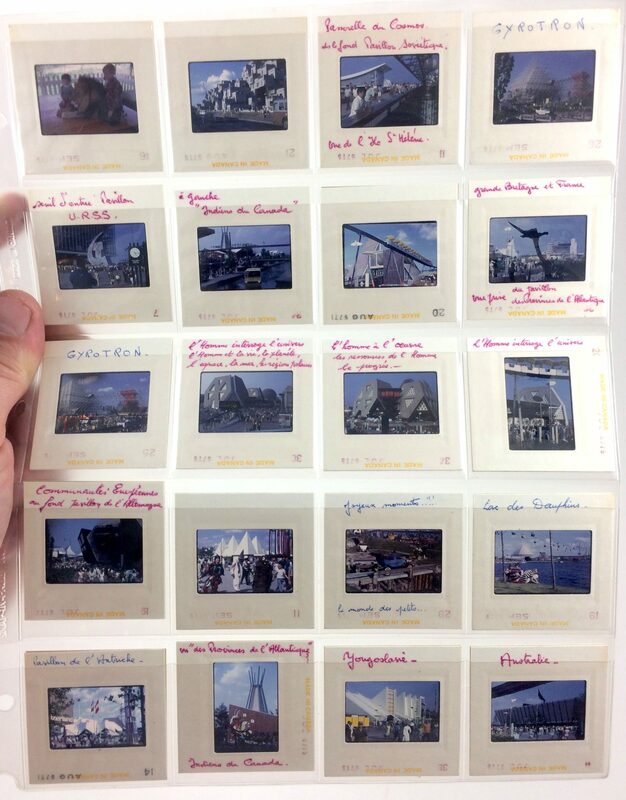 But instead of containing old school notes these mostly contained old slides and photos. 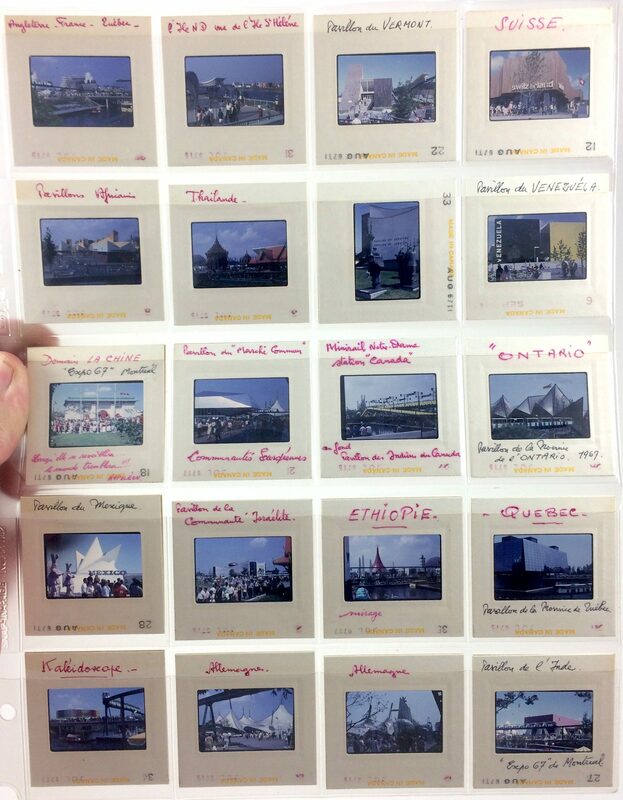 I should be able to make a few bucks off the one binder of Expo 67 photos. It contains about eight pages of slides, most of which look well shot and well captioned. I think my photos of the slides came out pretty well all things considered. Some turned out better than others, but unfortunately I couldn’t spend too much time on them. If you want to zoom in on the photos below, click on them and find the “view full-size” button on the bottom right hand side of the screen. My plan at the most is to auction them on eBay. 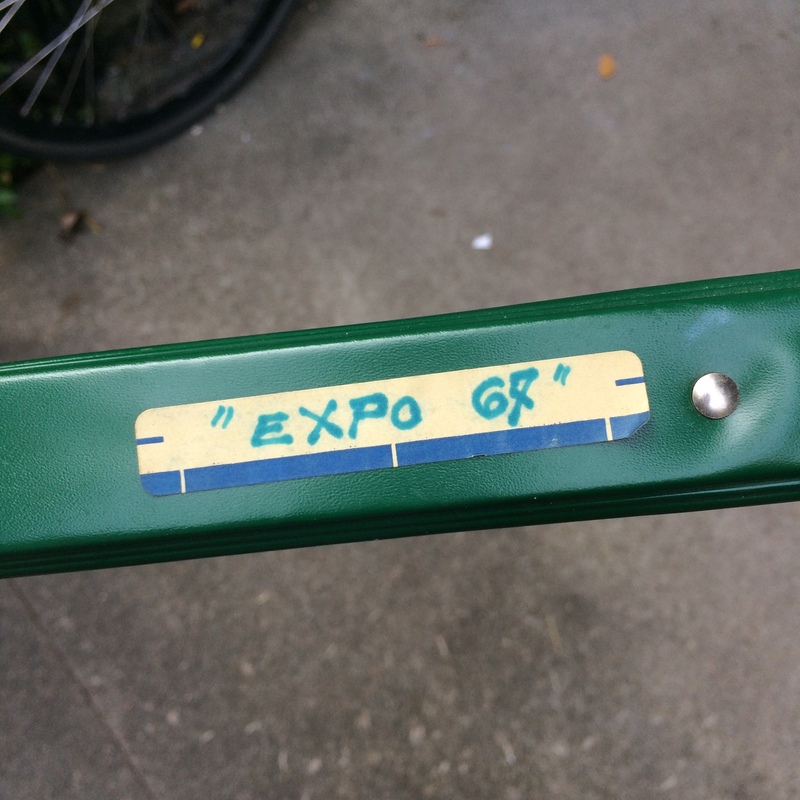 I don’t usually do auctions, but I figure that Expo 67 market is reasonably hot right now, and auctions make it so that I don’t have to think too hard about pricing. 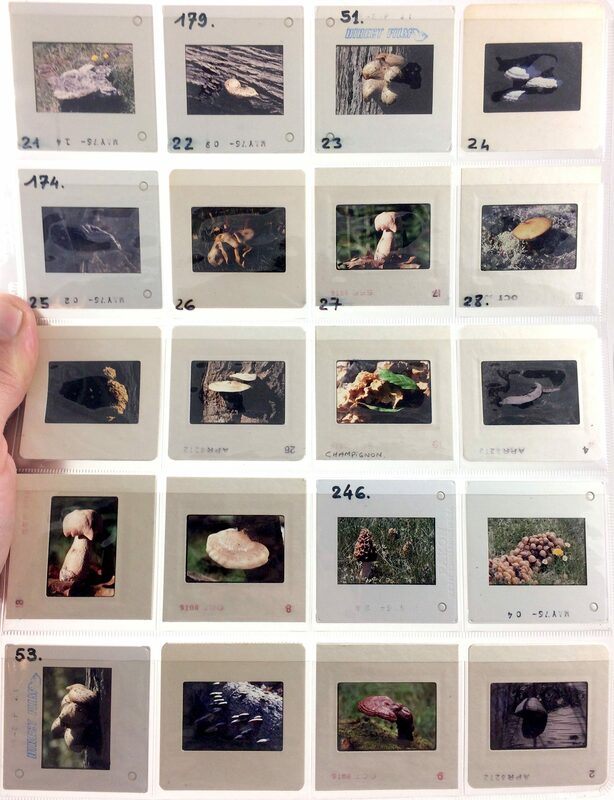 Otherwise, a lot of the photos feature various flora, fauna, and fungi. 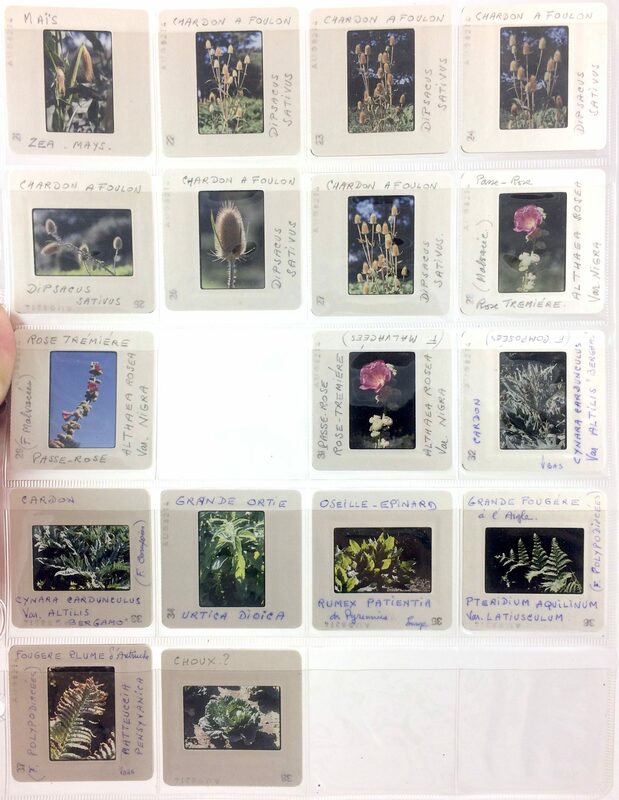 His knowledge of plants looks to have been pretty good, as many of them are captioned with their latin names. 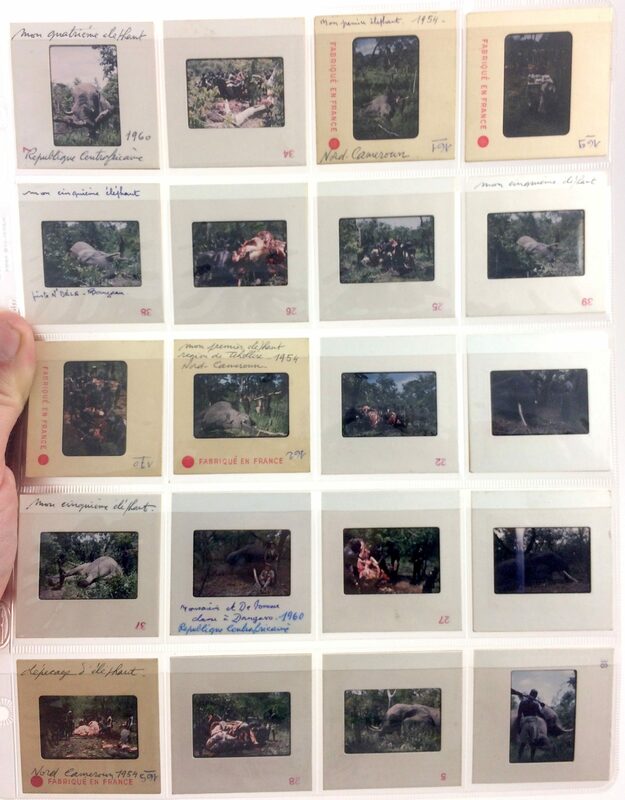 … and this particular page features multiple elephants being butchered. Unfortunately (or fortunately, if you have a weak stomach) my photo of this page didn’t come out as clearly as some of the others. I wonder how common photos of Africa are from that era. I suspect they’re still common enough, but I’m sure they’re less common than tourist photos of Europe and North America. Personally, I’ve found photos from the north of Africa before (like Egypt and Tunisia), but never from the area around the equator. 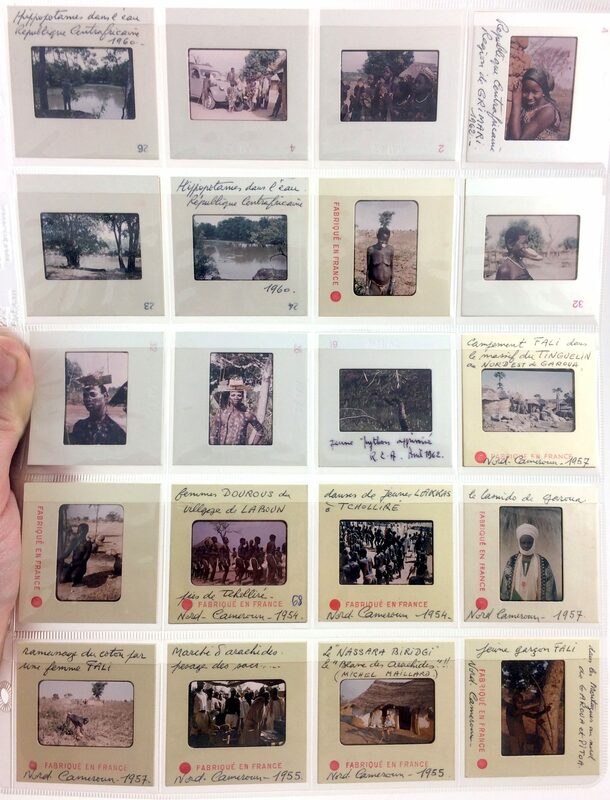 Most of these photos look to have been taken in Gabon, Cameroon, and the Central African Republic. It wasn’t immediately clear, from my brief study of the photos, what the photographer was doing in the area. 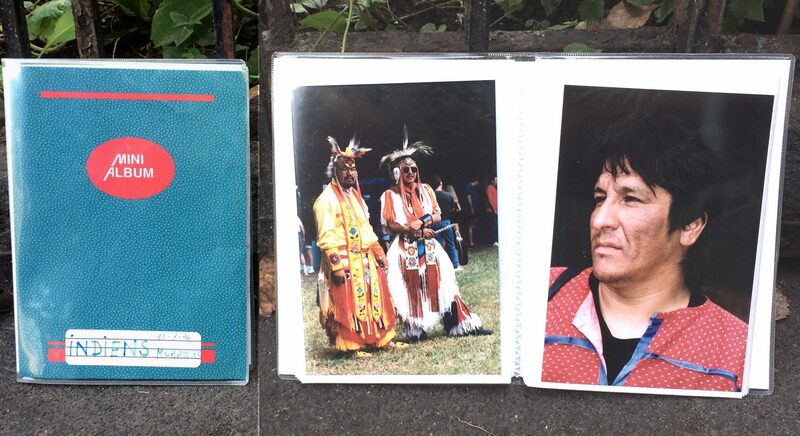 … and a few smaller albums filled with photos of local pow-wows. 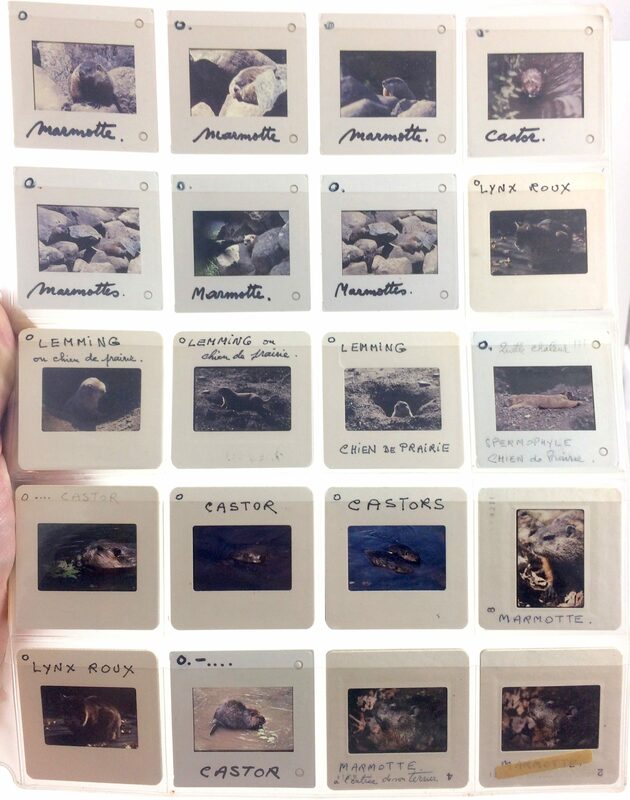 The location of these photos is unclear, but the other ones were taken in Kanesatake near Oka. They were all taken in the mid 1990s. 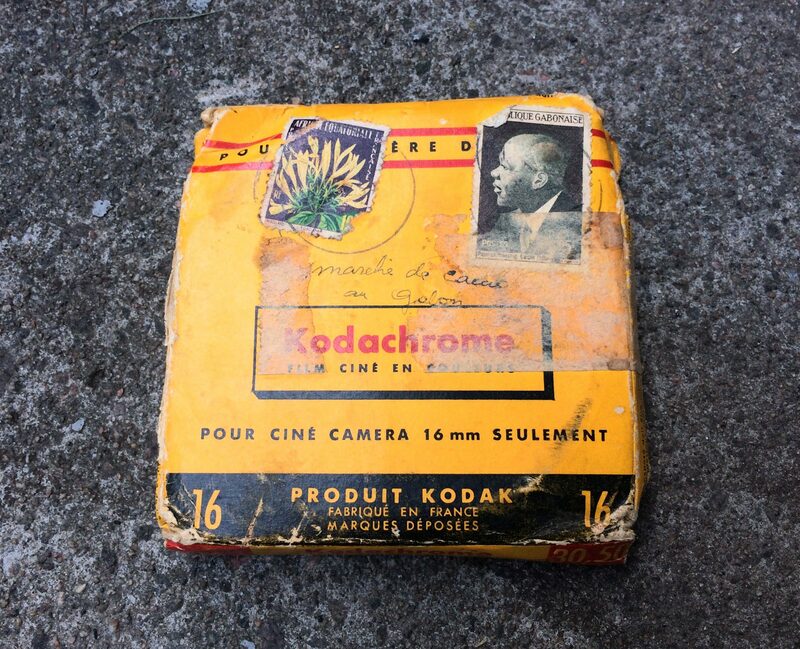 I found one film, a 16mm reel that was captured in Gabon in the 1950s. It could be interesting to digitize. 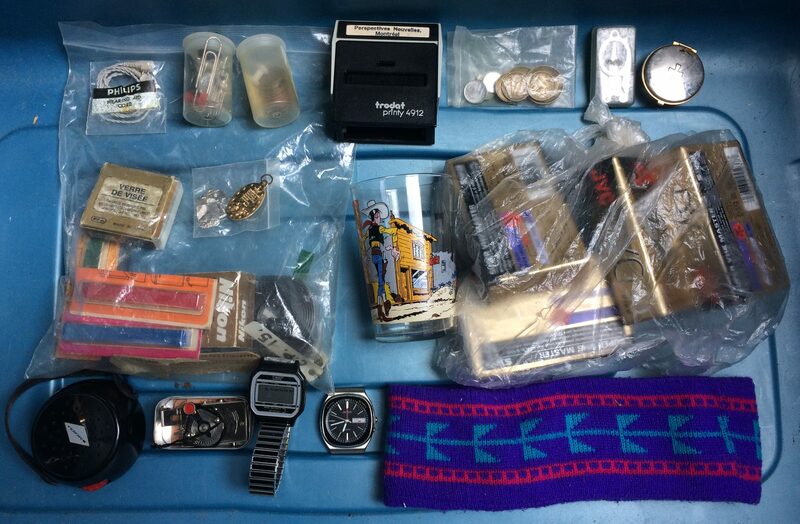 … and some smaller items suitable for the yard sale pile. The 80s watches are kind of neat, I’ll throw a battery in them and see if they work. 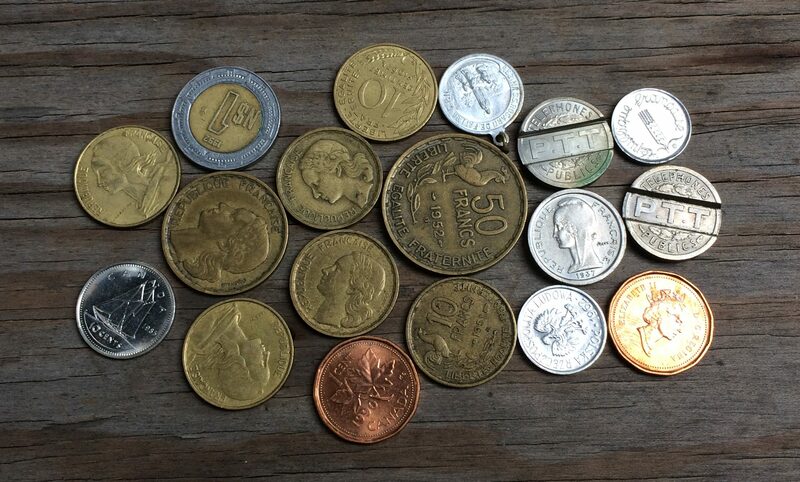 The coins were mostly from France in the 50s and 60s. The tokens on the right are for old French public telephones. None of these are worth much, but they’re good yard sale material. All in all this was a pretty interesting pile. I would guess that the person who took the photos has passed on. If he was in Africa in the early 1950s that would make him at least 85 years old today. That’s not too old of course, but I have a hard time seeing someone deciding to throw away their life’s work like this. 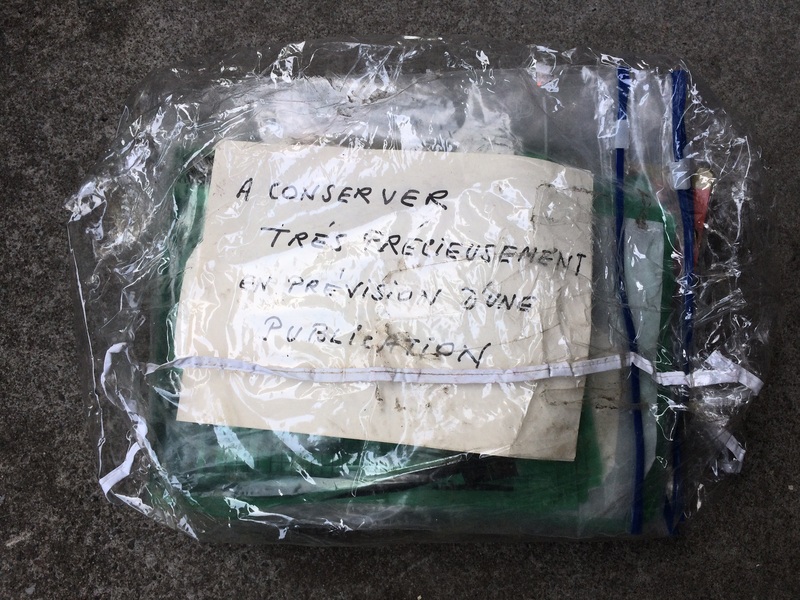 It’s a bit sad to find these things on the curb, but I like to think that he might have been happy to know that others are appreciating his work. I owe thanks to the reader who informed me of this spot, as otherwise it’s unlikely that I would have happened upon it. If anyone else knows of an intriguing garbage pile, feel free to send me an email. I plan on doing a yard sale tomorrow at 4096 Coloniale near Duluth. My storage space there is a total mess and I want to get it organized while it’s still warm out. Hope to see you there! Wow … it’s wonderful that you were able to save so many wonderful and varied images. (Though the elephant ones left me feeling both angry and sad.) Do any of the items identify who the photographer was? I hope you have a successful storage clear-out tomorrow! If it helps I think the elephant was butchered for food, not for tusks. It seemed like the photographer was just observing the locals for whatever reason. The photographers name is printed on many of the slides, but I chose not to show it in the interest of preserving his privacy. I will say that I googled the name, and found little record of it. Brilliant finds.But I am curious why the apartment was emptied and such stuff put out in the first place.Seems to be a sad story behind it. It is good you went there and saved these treasures.But what if these things had been thown out in St.Rose in Laval or in Kirkland.Chances are you would not have recovered it and no one else probably would have either.There is no conscience or thought given by some people when they empty old apartments.Keep doing this. (This is much less sad then the huge,huge haul you spotted on Parc La Fontaine street in The Plateau about three years ago). True that, unfortunately I can only cover so much ground. I think I remember that pile, if I’m right it was actually on Papineau and the stuff came from an older lady’s apartment. Wow, Martin! 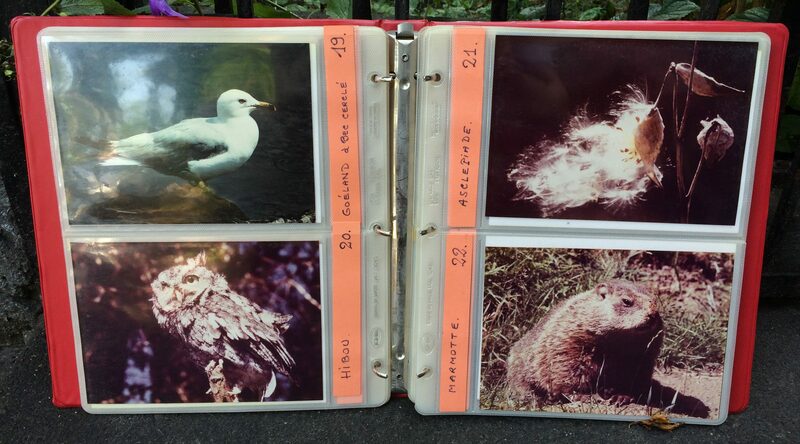 An interesting find…reminds me of some of the old photo albums my mom has. My dad loved to take “video” too on a reel to reel camera. My mom has several of those Kodachrome mail-away boxes. I think she had a lot of them converted to VHS, though I can’t be sure. I can’t help but feel sad too that this person’s work was discarded, but you’re likely right – the person probably died, and their family was left with this burden – or if they had no family, their estate was left with it…and what are they going to do with it? Likely pack up the apartment and put a lot of this stuff curbside. Later on,please mention which street this was on.I am curious.I used to visit St.Michel to meet a friend 10 years ago but I stopped because he moved south. It was on Marquette. Some might say that’s part of Villeray, but to me it’s St Michel (because that’s around where the garbage days are divided).